Pros and Cons of the Top Mouse Traps: Which ones Really Work? There are many different types of mouse traps on the market & I think by now I have tried almost all of them. All will catch mice, but there are differences depending on your level of comfort interacting with the dead mice and your budget. If you are looking for the best mouse trap, check the pros and cons to see which is most appropriate for your home. Which is the Best Mouse Trap for you? Here are the Pros and Cons of these 6 popular mouse traps. These traps are one of my favorite ways to catch mice quickly. To be successful, you should use several of these traps. You want to kill the mice as fast as possible! Placing three or more of these units in strategic locations is a very effective strategy. And it is cost effective since the traps are reusable. Victor Pest control makes one of the best electric mouse traps on the market. We have used the Victor M2524 Electronic Mouse Trap with good success. The upgraded version by Victor is the M250S pictured above. The Rat Zapper Classic is another favorite and has been getting great reviews (it works for both mice & rats). Click here to see more electric mouse traps. TIP: If you have just a single unit, then don’t wait a day or so in between kills to empty the trap. Remember mice live in groups, if you see one mouse, you probably have 5-6. If you are using just a single trap, it could be a week before you catch all the mice. From my experience, that is simply too long. If you only want to buy one or two electronic traps, just make sure to empty them as soon as possible. HOW IT WORKS: First you open the lid and bait the trap. The bait station is normally located in the back of the unit, so the mouse is forced to fully enter the trap. Once the mouse steps on the sensor, it triggers a high voltage electric current which electrocutes the mouse in seconds. It’s over quickly, so the mouse does not suffer. Then you simply turn the unit over, flip the lid open & empty it into the trash. Re-bait the trap and you are ready to catch the next one. These traps have a very high success rate. I have never found missing bait or a wounded mouse inside this type of mouse trap. It kills quickly. These type of traps are reusable. Each one can last for years. This is the best mouse trap for long-term use. The unit is enclosed in plastic, so you don’t have to see or touch the dead mouse if you don’t want to. The price of the individual mousetraps is a little more than the throwaway model. However, remember that they can be reused. So after the initial cash outlay, you should be good for a long time. Most everyone is familiar with the original wooden snap traps. They were cheap, but hard to set & you had to throw them away. The pest control companies have a much-improved version now that is made of hard, durable plastic that can be reused. 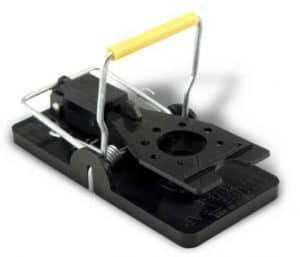 The Snap-E Mouse Trap is one of these new improved models & is one of the highest rated mouse traps available. HOW IT WORKS: The trap has a small cup where you can place the bait which is perfect for a tiny dab of peanut butter. You pull the metal lever back to just 90 degrees. Once the mouse steps on the plate, the metal lever is released and snaps closed catching the mouse in the process. Since the metal snap bar is placed at just a 90-degree angle instead of 180 degrees, it closes much faster & traps more mice. Very easy to set & release, since the metal bars are nice & sturdy. The release bar is positioned so you don’t need to touch the dead mouse. The traps are reusable, made from hard plastic & steel. See more about the Snap-E brand in our detailed review. There are many varieties of plastic mouse traps on the market. I have found the plastic enclosure traps to be very effective and I like that it is safe to use around pets/children. BAIT TIP: The trick with this type of mouse trap is to bait it correctly. The trigger isn’t quite as sensitive as in some other models, so if you have very small mice, sometimes they steal the bait without getting caught. Use just a small amount of peanut butter or sticky substance in the bait door, then push a little tidbit of food into it like a raisin, piece of chocolate or a nut. This forces the mouse to stop long enough for the trigger to snap. Works like a charm. HOW IT WORKS: The design of these traps is to have a hard plastic shell on the outside. There is a compartment inside the plastic to set the bait. You will press a lever or turn the trap until it clicks & is set. The mouse will enter through a small hole, step on the sensor, then whammo!! the spring snaps shut with the mouse inside. Then you toss the whole thing in the trash. They are very clean. The best thing about these traps is you don’t need to see or touch the dead mouse. If you are squeamish, then this is the best mouse trap for you. Pet & Child safe. Since both the baiting station & the spring loaded trap are enclosed in plastic, there is no danger of anyone besides the intended victim getting hurt. The traps are not re-usable. Could get expensive if you have a recurring problem. ***Tomcat also makes a version of the plastic snap traps, the Tomcat Press ‘N Set that gets high ratings from their customers. These traps are reusable and a more cost-effective choice if you don’t mind seeing the mouse after it’s caught. These traps can be used to catch the mouse then release it back into the environment. When using this type of trap it is important to empty them often and release them far away from your home. If you are looking for the best humane mouse traps, be sure to read our comparison of the top 3. 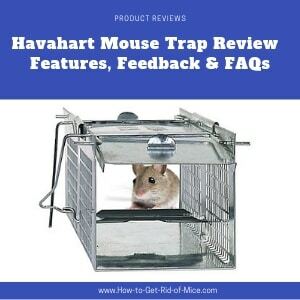 The Havahart Two-Door Mouse Cage Trap is one of the most popular live mouse traps available. It is made of a wire mesh casing that securely traps the mouse while allowing it a little room to move around & breathe while he is waiting for you to release him to another location. This is a very humane mouse trap to use and comes highly recommended. The only drawback is it’s a little large for use in some homes. Read our review on the Havahart Mouse Trap here. Another good live catch trap is made by Kness. 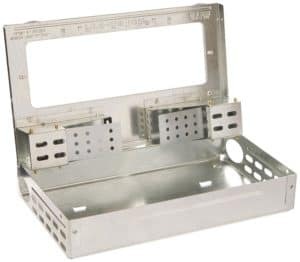 This trap has a slimmer design and is easier to place in tight areas. Suitable for catching multiple mice – it is large enough to allow the mouse room to breathe while waiting to be released. HOW IT WORKS: There are 2 main types of Catch and Release mouse traps: Metal Cages or Plastic Tubes. You will bait the trap with some enticing treat. Then you set the trap so the entry door is open. Once the mouse enters the trap, a trigger will snap the door shut. The mouse will be caught inside the trap. No kill, humane mouse traps. If you simply can’t bear to harm a living creature, then this is the best mouse trap choice for you. You need to monitor these traps more often since you are catching a living thing. Don’t leave them in the trap too long before relocating them back outdoors. You have to handle the mice, put them in your car & drive them to a release location. If you release the mice too close to your house, they may return to the nest, and you will be fighting a losing battle. I will drive about a mile away when using this method, I don’t take any chances that they may return. Personally, I did not have success with this method of getting rid of mice. However, I learned later than I did not use it correctly. To be successful you need to make sure you buy the right type of unit for the size of the room. If you get one that only covers an area of up to 100 feet, you can’t put it in a 300 square foot room & expect it to repel mice. The two brands we prefer are Home Sentinel and Neatmaster. The Home Sentinel 5 in 1 system comes with a money back guarantee which is always nice. They also have a long history in the industry. The Neatmaster UltraSonic Pest Repellent gets good reviews on both repelling mice and insects. It is also sold in several multi-packs which can save you a bit of money. Keep in mind reviews with this type of product are all over the board – some people swear by them & others don’t believe they work at all – it all depends on how the units are set up in the home and how bad their pest problem is. HOW IT WORKS: The Pest Repeller is plugged into the wall. An ultrasonic wave is released which will drive the mouse away. These are really more of a mouse repellent than an actual trap. There is no work involved in using these types of mouse traps. All you have to do is plug the unit in. The best mouse trap alternative if you don’t really want to kill the mice, but rather keep them away. If you have a very large house, the ultrasonic waves may not reach all the areas where mice are living. Is not as effective if you already have mice in your home. Not all ultrasonic traps are created equal. There are definitely some good products on the market, but there are also others that simply don’t work. Do your research before you buy. This is the only variety of trap I have not used. Removing the mouse from the glue trap is not something I wanted to try and disposing of the trap with the stuck mouse intact seems rather cruel to me. HOW IT WORKS: These work by trapping the mouse on a sticky surface. Once you see the mouse is stuck, you pick up the entire trap & throw it away. There is no snapping mechanism which could hurt little fingers or noses. They don’t always work. Sometimes you will just see a little fur on the trap. In my opinion, this is not a humane method of killing rodents. The glue doesn’t kill the mouse, it just works to keep the mouse stuck on the pad, then the mouse will slowly die since it has no access to food or water. Selecting the best mouse trap type will depend on the features most important to you. Use the following list to make the right choice based on your personal preference. Looking for a long-term efficient solution & don’t mind putting out a little more cash initially? Get the Electric Mouse Traps. Need an economical solution to trap mice fast? Use the Snap-E Plastic Traps. Don’t want to see or touch any part of the dead mouse? The Plastic Enclosed Snap traps are the best mouse trap for you. Need a no-kill mouse trap? Choose the Catch and Release Mouse Trap. Looking for a no-mess solution without the need to set traps? The Ultrasonic plug in type mouse repellent is for you. To discover even more ways to solve your mouse problem, visit our home page at How-to-Get-Rid-of-Mice.com.